I chose dentistry, because I like to “create” and “fix things.” I enjoy being with other people, especially if I can help them enjoy life more. Dentistry allows me to do this, and the challenge that I can rise to has kept me coming back to it every day for the last 25 years and counting. I love that I never know who I might meet that day. It is a rush. My goal is to make each patient feel comfortable and provide the highest quality of dental care that meets his or her specific needs and desires in coming to my office. I am a Chicago native and love my city. I felt no need to go very far for my education, especially with all the great schools in the area. I attended DePaul University in Chicago’s Lincoln Park for my undergraduate degree. Then I earned my Doctorate of Dental Surgery from the University of Illinois College of Dentistry. I am always seeking new and improved ways to deliver high-quality dentistry and to improve patient care with more efficient procedures. I personally attend numerous continuing education courses and professional development meetings. Whenever possible, I also bring my team. Chicago offers a number of great opportunities for us to improve the quality of care we offer. We attend the Chicago Midwinter Meeting every February and do quarterly “Lunch and Learns.” We also take online training courses. I am part of the Pride Institute (dental management), which allows me to stay on top of quality practice management and patient-relations protocol. One of my accomplishments is being on the advisory board for Crest Pro-Health. It gives me the opportunity to be associated with an amazing line of oral healthcare products and to communicate with many brilliant, dedicated professionals who work to improve the quality of care in dentistry. I’ve also had the amazing opportunity to represent Crest ProHealth products in national and international TV commercials. From 2007 to 2012, I filmed several ads for the Pro-Health products along with radio spots and magazine print advertisements. It was an experience that I will never forget. I feel so grateful every day I go to my office. I aim to provide incredible dentistry that is noteworthy for the level of caring and patience. I am the kind of person who can easily accept and embrace people for all their quirks and differences. My office is a safe place for people of all walks of life and from all parts of the world. I know that we are all more alike than different, and each person deserves and needs high-quality dental care. My promise is to always deliver the best available to each patient no matter what. I believe that my work goes well beyond my patients’ teeth and gum lines. A healthy mouth affects the rest of the body and can even help boost people’s confidence. It is very important that everyone gets the best dental care that takes advantage of all the great advances in dental technology and techniques. I also want to establish a good routine for my patients so that they walk out my doors with the “perfect” smile and the know-how to keep it. I am passionate about giving back for all the ways I have been blessed in my life. I try to pay forward, because I have the time, talent, and skills to make my city a better place. I volunteer my dental services through Smiles for Success and community outreach health and well-being clinics and fairs. I have been active in nonprofits for more than 20 years. For about 18 years, I have been a board member for St. Bernard Hospital, an inner-city facility dedicated to helping those underrepresented in many areas. LINK Unlimited was a intregal part of my life for about 16 years. It is a scholarship/mentoring organization for which I served as mentor/sponsor and board member. I have since retired my seat and am looking for other groups to work with. I grew up in Chicago and settled down in Hyde Park, President Obama’s neighborhood, on the University of Chicago campus. I took up English riding late in life (about 8 years ago), and who would have ever imagined this would be one of my greatest passions? 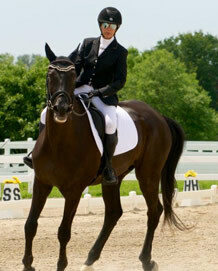 I visit the barn each weekend I am in town, and train weekly with my trainer to compete in local dressage competitions. There are a few blue ribbons to brag about. I also love going to the theatre and travel to New York City regularly to see productions. I have recently felt very adventurous and have been tandem skydiving, zip-lining in Costa Rica, and white water rafting. I enjoy traveling, going to the spa, and golfing. I consistently exercise and had the same personal trainer for 16 years until 2009 when he left for Washington D.C. and the White House to train the Obamas. We were all gym buddies!! In spite of this active play and sports lifestyle I have, I truly enjoy being at home with a good book in front of a crackling fire. Chicago has plenty of cold winter days for that.